I found videos showing what needed to be done. Sometimes I borrowed techniques from multiple videos. In August I bought fenceposts, concrete, and gravel and planted new fenceposts along the property line. 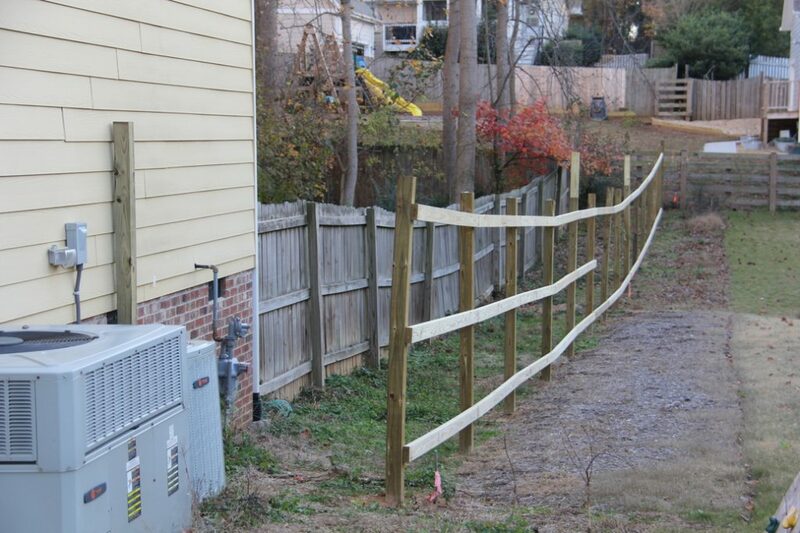 It was about then that I realized the City of Raleigh now requires permits for fences. Not only that, the permit application requires a fresh survey! D’oh! Several weeks later, I ordered a survey and purchased a permit. These alone became about 25% of my expenses, which I’m not happy about but hey, it’s legal now. Now I’ve almost completed the rails that will hold the pickets. I’ve purchased a pneumatic nailer and nails. I have 290 pickets in the driveway, waiting to be nailed up. Overall, it’s starting to look really good. My perception is that the new neighbors aren’t happy about all the walking around I’m doing in their backyard to get the fence built but I do think they’ll be happy with the result. If I have the whole weekend to work on it, I expect I can get it done by Sunday night. That’s not usually how my weekends work, though, so I’ll do what I can and save the rest for another day if needed. At the end of the project I’ll have a beautiful fence, I’ll have some new tools and skills, I’ll have saved a ton of money, and I’ll have some pride in doing something for myself. It’s hard to go wrong with this combination.